To use this angle converter, choose two units, then type some value in the box at left (input). The converted result will immediately appear in the output box at right. Definition: A shape, formed by two lines or rays diverging from a common point (the vertex). The angular measure of an object is usually expressed in degrees, arcminutes or arcseconds. Just as an hour is divided into 60 minutes and a minute into 60 seconds, a degree is divided into 60 arcminutes and an arcminute is divided into 60 arcseconds. To make basic angle measurements, we can use a protractor which is probabily the most basic angle-measuring instrument, a common object used in school math classes. To make precision angle measurements we need a beter instrument like a Digital Angle-Measuring Device, a Theodolite - used mainly by surveyors in civil engineering roles - or a Goniometer. How small is a micro-arcsecond? See bellow to have an idea. In astronomy, we often use angular measurements to describe the apparent size of an object in space and the apparent distances between objects. The star Epsilon Eridani is close enough to the Sun that its distance can be measured by the method of parallax, which gives the angle (p) 310.74 mili-arcseconds = 0.31074 arc seconds. This can be converted to 3.218 parsecs (distance unit equivalent to 3.26 light years). Micro-arcsecond is used to detect Earth-like planets orbiting in the habitable zone (HZ) of Sun-like stars. It is probabily the most basic angle-measuring instrument, a common object used in school math classes. This instrument is normally semi-circular and is often used by students in the classroom. A theodolite is a relatively complex type of angle-measuring instrument that is used mainly by surveyors in civil engineering roles. It consists of a telescope that the user can look through to see a circular shape marked out in degrees, minutes and seconds (º ' "). At this level of detail the surveyor measurements can be very accurate. It is an optical instrument based on the telescope that is used for determining the horizontal and vertical angles between two points and for calculating distances. Consists of a circular dial with degree measurements around the outside and tens of degrees in an inner circle. It has two arms, one that remains stationary and one that is movable. 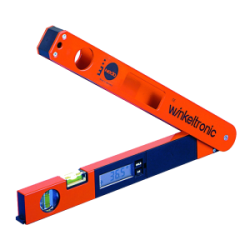 If we want to measure a simple angle, for instance in construction, we can use a digital angle-measuring instrument to get a quick answer. These devices have two arms, which can be inserted into a corner and moved to fit the angle. A digital display then shows the measurement in degrees.